​London, 21 February 2013 – Tokyo is the world’s most expensive prime logistics market as multichannel retailers seeking new facilities and requir¬ing larger spaces drive demand in the world’s leading cities, according to new research from global property advisor CBRE Group, Inc. (CBRE). 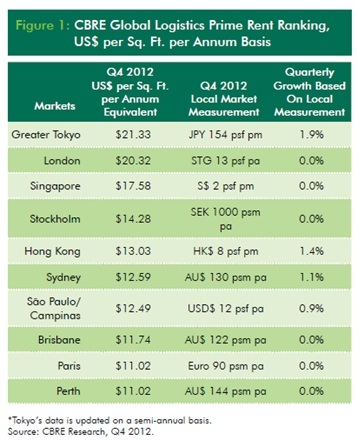 CBRE’s quarterly survey, which tracks the top 10 most expensive prime global logistics markets, reveals that rents were stable during the fourth quarter of 2012 (Q4 2012). Leasing activity was predominantly driven by e-commerce retailers and third party logistic operators building interna¬tional capacity. Despite weakening consumer sentiment, the industrial market remains stable as low levels of development has counterbalanced subdued demand. This trend, combined with occupiers’ preferences for prime logistic facility space, has maintained prime rent levels in most global markets. The CBRE research highlights that three Australian cities rank among the Top 10 most expensive logistics markets in the world, with Sydney coming in at 6th place, following by Brisbane in 8th position and Perth in 10th place. While occupier demand in Sydney remains cautious, the report highlights that a strong preference still exists for good quality, well-placed logistics space. With vacancy levels low for such stock, pre-commitment activity has been prevalent, helping to boost prime rents during Q4 2012. CBRE Regional Director, Industrial & Logistics Services, Joshua Charles, said the vacancy rate for existing A-grade faculties in the major Australian markets was the lowest it had been in a decade which was helping to support rental increases. “Incentives on prime logistics facilities are now back to pre-GFC levels,” Mr Charles said. Mr Charles said expectations were for additional – albeit slight – growth in rentals in 2013 and a further increase in speculative construction. “The high Australian dollar has increased the need for local warehousing as importers ramp up their buying and, by extension, their need for storage,” Mr Charles said. However, he noted that e-tailing was not having the massive direct effect that many believed. “Instead, third party logistics groups are picking these up as additional contracts that require more storage space,” Mr Charles said. In regards to other global markets, the CBRE report highlights that Tokyo is firmly established at the top of the international rental rankings with demand from online retailers and third-party logistics operators driving demand. Rents in Tokyo grew by 1.9% during Q4 2012 as the market witnessed an increasing number of cases in which landlords succeeded in raising renewal rents of existing tenants, though the rental increases remain small. Similar to many Asia Pacific markets, London (and Stockholm) has experienced cautious tenant demand amid an environment of uncertainty, weak short-term economic outlooks and low levels of consumer/corporate spending and capital investment. Despite this, limited availabilities for prime space bolstered prime rent levels in Q4 2012. Singapore also anticipates a strong develop¬ment pipeline in 2013, with demand stemming primarily from technology, pharmaceuticals, chemi¬cal and energy sectors. Meanwhile, in Hong Kong most projects are scheduled for completion in 2014; as a result, Hong Kong’s rents remain firm, growing by a slight 1.8% in Q4 2012 driven by cautious but steady de¬mand from logistics and data centre operators willing and able to pay high rents for prime space. “While trade performance is expected to remain soft in many markets, the overall global industrial logistics market will remain positive due to tight vacancy levels and constrained levels of new supply. Consumer expectation for faster, more secure, and cheaper delivery is gathering momentum and retailers and distributors will need to keep up with this demand. This is resulting in a growing need for cross-dock facilities closer to the final destination to serve the last part of the delivery chain.